I realized I've not posted in a few days and I'm still stuck as to what to put out for the 52 weeks of color challenge. But it's been fun looking. I'm thinking of the following, which is a Alexohol mesh dress with a funky hair style from Vanity hair (everything else if from last week's post), but I'm not sure..it's sorta blah. 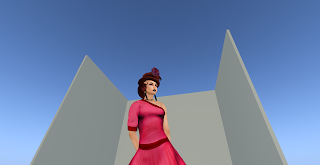 In a completely unrelated note, to my previously unrelated note, am I the only one in SecondLife who's home is a sky island with a home-made studio for taking photos and a random pose stand?